Globalist migration advocates began a campaign last week to try and shame Canadians into removing “illegal” from our vocabulary, specifically, “illegal border crossers.” They want Canadians to say “irregular” instead. Their reasoning is that using the term “illegal” to describe people illegally crossing the border (people the RCMP have arrested for an illegal act) is “toxic” for the illegal border crossers. Audrey Macklin is a Law Professor and Chair in Human Rights Law at University of Toronto. She is an influential voice having been “active in the Omar Khadr case”. That is the case in which PM Trudeau Liberals gave the child ISIS fighter Khadr, who killed an American doctor in battle, $10 million dollars for how he was treated while detained. 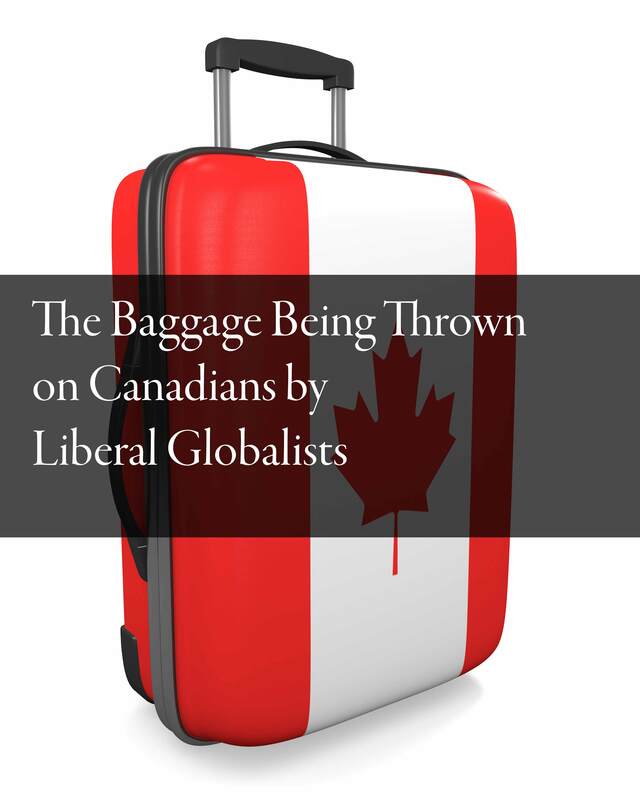 With regards to illegal border crossers, Professor Macklin is loading up a truckload of emotional baggage being offloaded onto Canadians by Globalist migration advocates, most of whom are lawyers and other highly paid professionals. Bag # 1: Professor Macklin introduces her article with an insult to Canadians. Prof Macklin says that “no [Western] state wants to receive…real refugees” thus causing real refugees to make their own way to Western countries and enter the countries illegally. Really? I’m pretty sure that Justin Trudeau campaigned to bring 25,000 refugees to Canada in his first three months and Canadians elected him on that promise. Canadians are generous and welcoming many of whom privately sponssor refugees as well. I’m not sure about the people in The U of T Ivory Tower, but everyday Canadians do care about “real refugees”. “Illegal border crossing” describes the commission of an illegal act, not a person. Western democracies are safe countries that people want to migrate to because, while we are compassionate, we put the hard work and tax dollars into having our laws enforced to keep everyone safe. Please also review the years 1914-18 and 1939-1945 in which Canadians fought for our democratic freedoms to say something is “illegal” when it is “illegal” as stated by the RCMP who arrest people who cross the border illegally. Bag #3: Professor Macklin’s thinking is that because she feels Canadians (all Western countries) reject real refugees, the real refugees who have had to “clamour on the back of a truck… or board a plane with false documents”, are wrongly lumped together with illegal migrants. The reality is, what can be seen and heard at the border as shown by the Liberal Left CBC News: the majority, if not all, of the people showing up at the border are stepping out of taxi cabs or air-conditioned buses, well-dressed, well-fed, and well equipped with legal loop hole language ready to push past the RCMP. These are not people in ill-health, dressed in rags getting off the back of a truck and asking for asylum in Canada because they are fleeing violence. Most of the “asylum seekers” at our border were able to buy airline tickets to get here and have nicer luggage than many Canadians, certainly nicer than the homeless Canadians who push around shopping carts. One in seven Canadians live below the poverty line and/or are homeless, many or most of whom have paid Canadian taxes throughout their lives. That is a known fact. We have no idea who is showing up at the border in response to the virtue signalling globalist calls by Liberals. Real refugee or someone trying to push ahead of real refugees and homeless Canadians. If Professor Macklin would like Canadians to err on the side of unknown foreigen migrants instead of Canadians we know are in need, why isn’t U of T Law School giving these real refugees (as depicted in Professor Macklin’s article) real homes in U of T dorms while they wait a year or ten for their hearing? that are stepping in front of her real refugees. It’s the least U of T can do instead of trying to pile up enough globalist emotional baggage that Canadians can’t see our own homeless and needy. Professor Macklin may be well intended, but she and her globalist migration advocates have lost sight of Canadians. This entry was posted in Immigration, Politics, Canada, Think Over News and tagged asylum seekers, illegal immigration, Liberals, migration costs, roxham road, Trudeau, u of t, university of toronto.